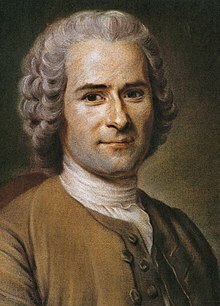 Jean-Jacques Rousseau (French: [ʒɑ̃ʒak ʁuso]; 28 Juin 1712 – 2 Julie 1778) wis a Genevan filosopher, writer, an composer o 18t-century Romanticism o French expression. His poleetical filosofie influencit the French Revolution as well as the oweraw development o modren poleetical, sociological an educational thocht. His novel Émile: or, On Education is a treatise on the education o the whole person for citizenship. His sentimental novel Julie, ou la nouvelle Héloïse wis o importance tae the development o pre-romanticism an romanticism in fiction. Rousseau's autobiografical writins—his Confessions, which initiatit the modren autobiografie, an his Reveries of a Solitary Walker—exemplifee'd the late 18t-century muivement kent as the Age o Sensibility, featurin an increasin focus on subjectivity an introspection that haes characterizit the modren age. His Discourse on the Origin of Inequality an his On the Social Contract are cornerstanes in modren poleetical an social thocht. Rousseau wis a successfu composer o muisic. He wrote seiven operas as well as muisic in ither forms, an he made contreibutions tae muisic as a theorist. ↑ "Preromanticism Criticism". Enotes.com. Retrieved 23 February 2009. ↑ See an aw Robert Darnton, The Great Cat Massacre, chapter 6: "Readers Respond to Rousseau: The Fabrication of Romantic Sensitivity" for some interesting examples of contemporary reactions to this novel. This page wis last eeditit on 15 Apryle 2017, at 17:06.